Strawberries & Crème Frappuccino® Blended Crème is a drink we all love at Starbucks. This is the perfect drink for those of us who do not like coffee as much as other people do. 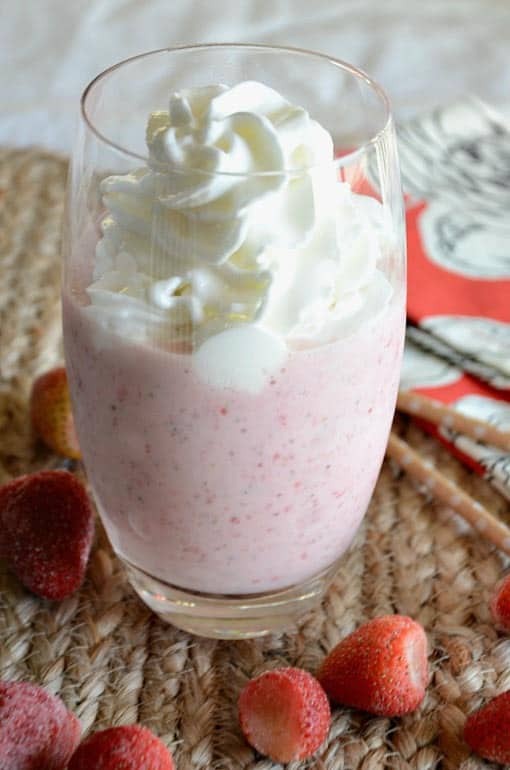 This strawberries and cream frappe is sure to put a smile on anyone’s face. Starbucks has a large variety of different beverages available to its patrons. Most of them are coffee or espresso based but there are a few that drinks that are made for the non-coffee drinkers. The offer teas, handmade sodas and cream based frappuccinos. This strawberries and cream frappuccino is a customer favorite at the popular coffee house Starbucks. It is light and refreshing and more of a dessert drink then a pick me up. Although it’s called a frappuccino, the strawberries and cream drink does not have any coffee in the mix. Its a combination of strawberries and milk blended and then topped with whipped cream. Making it at home not only saves on money but also a few calories. 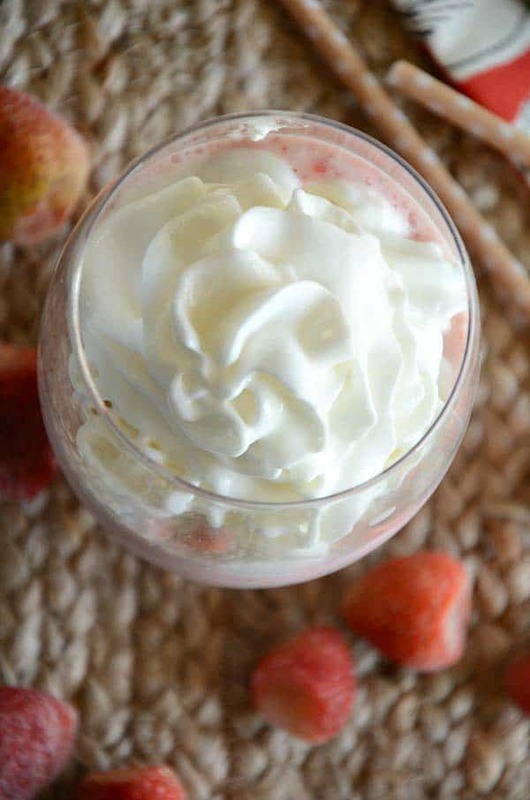 The strawberries and cream frappuccino is an easy one to make at home. The best part is that this drink uses common ingredients that you may already have on hand. Milk, strawberries, syrup, ice cream and ice. Oh and whipped cream. You can’t forget the whipped cream topping! I used frozen strawberries instead of fresh and was able to omit the ice. It makes the frappe a little bit creamier in my opinion. Love Starbucks? Be sure to check out these favorites. You can make this coffee house treat at home. In a blender layer the ingredients starting with the ice cream and ending with the ice. Blend until smooth. Pour into a glass, top with whipped cream and enjoy! 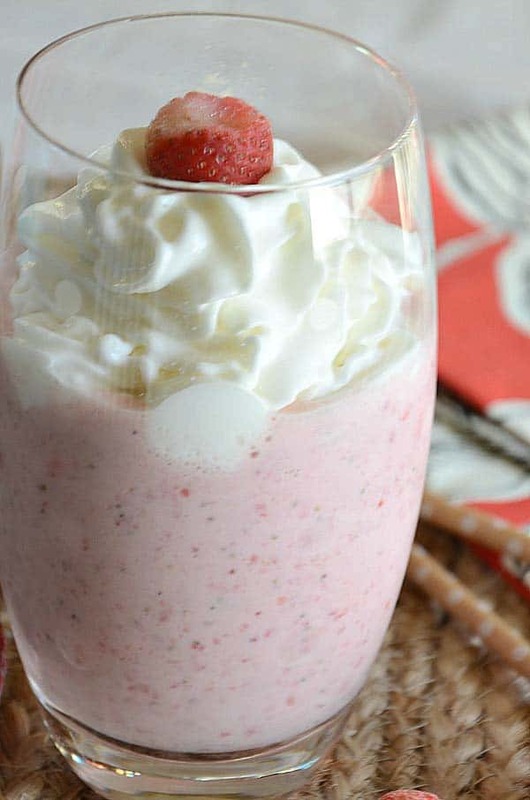 This recipe makes one strawberries and cream drink. Looks like so delicious. Thank you so much for sharing this. Very good recipe, thank you for posting it. You could put two straws in it. Wonderful recipe. Thanks for sharing. Isn’t hard to do. I’ve never tred ths drnk at Starbucks but now I won’t have to because I can make t much cheaper at home! Thanks for the recpe! This is MY drink when I go to starbucks. Great, thanks for sharing, I hate and sometime can’t afford the big box stuff.